A Long Island attorney is furiously working on filing an objection to the U.S. government-backed bankruptcy and sale of Chrysler to Fiat. Leonard Bellavia, of Mineolas Bellavia Gentile and Associates, said Wednesday that he is finishing up his brief, due by 4 p.m. Thursday, on behalf of 25 dealerships on the east coast, including four on Long Island, to send to Judge Arthur J. Gonzalez, a U.S. bankruptcy judge for the Southern District of New York. The dealerships Bellavia represents were among the 789 Chrysler announced it was closing. In his brief, Bellavia said he will argue that the sale to Fiat is not in the best interest of Chrysler and violates bankruptcy law. He said the sale should not be approved because it is being disguised as a company reorganization. In addition, he said the sale should not go through without the 789 rejected dealerships because doing so would jeopardize Chryslers financial success. He also argued that having more dealerships would put the company in a better position when it resurfaces from the sale and reorganization. The dealerships are all independently operated. Bellavia said his brief will be a supplement to an objection already filed by the Committee of Chrysler Affected Dealers , which claims to represent nearly 300 dealers in 45 states. That groups objection hopes to delay hearings that would approve the sale and the termination of the dealers agreements. 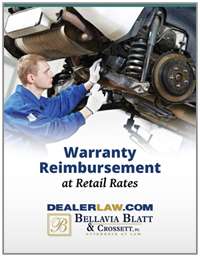 A hearing on the motion to terminate the dealer franchise agreements is scheduled before Gonzalez on June 3. Bellavia said he welcomes the committees objection.